The Chip-Module Test Unit establishes a contact with up to 6 RFID-Chip-Modules located on the module tape by using test pins. A single RFID-Chip-Module is selected by an integrated RF-Switch. The CMT Unit gives full access to the RFID-Chip-Modules during production process. It is easy to create UID-Lists containing all unique chip identification numbers. The CMT Unit supports the tracking of RFID-Chip-Modules throughout the production process and improves quality control. Different Chip-Module form factors are supported. In addition to standard form factors like MCC8, MOA2, MOA4 or MOA6 the CMT Unit can be adapted to customer specific form factors. Digital control lines select one out of 6 RF-Channels by using integrated RF-Switches causing very low RF losses. 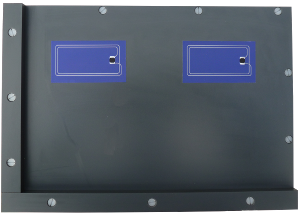 The selected RFID-Chip-Module is matched to a 50 Ohm antenna system giving highest flexibility. The Industrial reader module URM-IND in combination with the Chip-Module Test Unit provides a powerful solution for smart card production machines and smart card test equipment. The Production Test Fixture is a flexible box for product inspection in production and quality control. 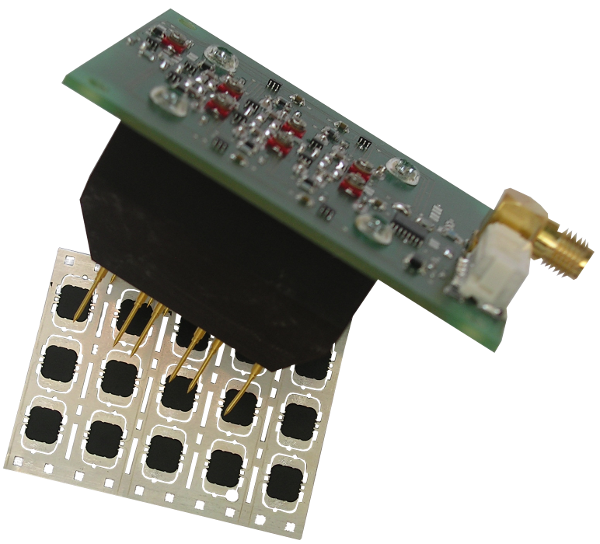 The Production Test Fixture equipped with the URM solution enables RFID-Transponder functional tests and personalization. RFID-Readers, RFID-Antenna switches and RFID-Antennas can be included into the box. Moreover the Production Test Fixture can contain measurement antennas and a vector network analyzer (VNA). This allows the measurement of electrical properties of RFID-Transponders like Resonance Frequency and Quality of RFID-Transponder. Our Resonance Frequency Kit contains the Production Test Fixture, a compact vector network analyzer including calibration kit and data acquisition software. The picture shows the Production Test Fixture for a 2-up e-Cover format. The device is mainly a box and needs to be customized. Different arrangements of antennas and different dimension on customers request. Please contact us for adapted solutions.